Wilderness times. Dry seasons. Physical affliction. Betrayal. Spiritual pride. Divine delays. Struggles with flesh, struggles with temptation, affliction, tribulation and hassles. Tests from enemies and tests from friends. Some decisions — too many — made without consulting God. While the details in my life’s story likely look very different than yours, they also probably hold many similarities. Times of testing for purity. Times of delayed healing. Realizing that even in my loyalty, I missed God’s highest purpose. Even in my sincerity, I fell short by failing to consult Him. Even with a desire to please Him, I lost achievement of His best. Painful truths, to be sure, but necessary lessons in order for maturity and desperate dependence to grow. Agonizing delays waiting for stewardship ability. And embarrassing failure in the process of learning complete reliance. “Enlarged” does not fully describe my heart, but “being enlarged” does. At times, the reality of an enlarged heart peeks through, but it quickly slips away as my focus goes to the cares of the world, to the struggle instead of to the victory. Is a heart expanded by God to carry the concerns of others. Has a passion for reaching beyond the concerns and issues that affect our own personal life to embrace the needs of others. Has a heart for the world. Is a heart beating with the passions and concerns of God Himself. Is given greater capacity to channel God’s love to others. Finds its interests much broader than the confines of its own ministry involvement. Freely delights in seeing blessings of God abound elsewhere. Is free of jealousy, competition, and comparison. Knowing the goal helps. Understanding what an enlarged heart looks like shows me the path God is creating in the wilderness and the refreshing streams He’s creating in the dessert (Isaiah 43:18-19). As God continues enlarging my heart through trauma, crisis, troubles and even calls for radical obedience, the truth that this work comes from Him and through no effort on my part becomes increasingly real. The value of perseverance, patience and love in the midst of this pressure draws me closer to Him, pulling me to a new spiritual plane where weeping and tears along with tastes of divine pleasure flow from an enlarged heart that is also still being enlarged. DISCUSSION: How is your heart both enlarged and being enlarged? This entry was posted in Struggle, Victory! and tagged Bob Sorge, enlarged heart, enlarging heart, The Fire of Delayed Answers by admin. Bookmark the permalink. I've always been amazed at Jesus' story of those on the last day, "Lord, Lord, didn't we prophesy and perform miracles?" and He says, "depart from me, I never knew you." There was no intimacy and Amplified says "your works were unauthorized." So it's not good intentions or even good works that get us anywhere, it's that intimacy and knowing Him, the relationship. Great, challenging thoughts here, Kari. Thank you. Great verse to apply here, Jason. Knowing Him more is always the answer, it doesn't matter the problem. Part of my focus on "details" for 2014 involves letting Him infuse every detail of my life, which will definitely enlarge my heart. What a well thought out, encouraging post, Kari. Right now God is enlarging my heart by showing me I have to let go of some painful relationships. I've always thought I was having an enlarged heart by continuing to try to make it work, but now I see that I am not focused on Him or on others who could really benefit from ministering to them. I'm not talking about my marriage, thankfully. 🙂 I am praying this year will be one in which my heart is truly enlarged and not just broken because I return to the wrong relationships. The Bible has a lot to say about how to deal with wrong relationships, Melanie. I've had to delve into this too in order to protect my heart. Touchy because we know we must be light & salt, but it can't be at the expense of our own relationship with Christ. Let me know if you need/want someone to walk with you more in this area. Email or in comments. I have to honestly say I have never asked God (out loud) to enlarge my heart, but I have seen Him do it subtly (at least to me). But my prayer is this year He will do just that. Me either, Bill, but as I think about asking that specifically, I realize how much of a leap of faith it is. To ask God to "enlarge my heart" and to trust Him to work out the details says that He can have more control than I've ever relinquished before. It says that I trust Him to reveal the details as he knows is best in His timing. Easy when I've feeling good, but I know this trust will be challenged in the struggle. Kari, I loved this! God is enlarging my heart by helping to see Him in the daily, and by helping me look beyond my current circumstances to His faithful blessings. He is so perfect in how he enlarges our hearts, isn't He? He does it with perfect timing & placement. If we place trust in Him to enlarge our hearts as He sees best, He uses every detail of our lives to perfect us through the enlarging of our hearts. Being as the original Hebrew for what we translate as heart actually refers to our "guts" or internal organs. So I would add that those "gut wrenching" times are God's way of catching our attention. Just as in athletes, having a solid core builds balance and stability for us physically, it also anchors us spiritually as well. For a Christ-centered life I would suggest we not only open our hearts but let him take over all of us from the inside out. Thanks for bringing this up, Coach! I remember my pastor saying that it referred to our "bowels." Changes the depth of meaning for sure. Gut wrenching… solid core… stability… being spiritually anchored… a Christ-centered life… all aspects of Him enlarging our hearts, changing us from the inside out. Great points & expansion of the topic. Thank you! You really hit home for me this week Kari. I have been struggling and I am spending time praying, reading, resting today in a effort to understand what God is trying to show me, to teach me. When I read the list of what an enlarge heart looks like I found myself realizing that God had indeed been enlarging my heart without my even realizing it. And I have no doubt He who began His work in me will continue to do it until the day I stand before Him in glory. Thank you as always for a thoughtful blog to challenge my thinking. We feel like we're waiting when really a lot of work is being done that we are unaware of. That's so often how God works in our lives. And we know that the way He works is always perfect. You smacked me upside the head with by reminding me that growth really has nothing to do with my own feeble efforts. I so often get caught up in a performance mentality. I think if I can just do enough God will bless me or answer my prayer. But His love and grace aren't based on efforts, its based on who He is. He is God. He is love. He will complete what He started in me…I just need to get out of the way! I get caught up in "performance mentality" all too often too, TC. Partly it's upbringing but largely it's human nature. His love & grace give me confidence to keep trying and moving forward even in the midst of the mistakes I make, and that is where the growth comes. We can't forget that it's a partnership either. He COULD do it all, but He wants to work with us. Baffling but true. When I read through the description of the enlarged heart I realized that that is much of what God has been teaching me about writing as I work on my goal of keeping Him first while I write and writing in fellowship with Him. I love what you wrote here, Kari: Struggling toward maturity in Christ and a desperate dependence where prayer lives as a necessity. The nice thing about having a goal you can't accomplish on your own is that you come to that point of desperate dependence – and that's often what leads us to maturity in Christ. And I love that even in our "desperate dependence," God asks us to partner with Him even though He really doesn't need our help. I think that's SO cool. He could force us to mature but asks us to work with Him. That really gets me excited. You have went deep on this post Kari…just reading the comments is encouraging for all of us want an enlarged heart. And how He works that desire out in our lives make look different but produces the same results. Your post reminds me of a song. This songs has been my husband and mine theme for our life. I sang it at every church we ever shared in. The words still ring true in my heart, all He wants is no less then me. Great post. The comments have been very encouraging for me, and I am glad they are for others too. Thanks for sharing the song. It fits perfectly here! Sometimes I'm painfully aware that my heart is not as enlarged as I think it is or as I pretend it is. It seems to me that prayer plays a key role here. When I realize that I'm growing cold and uncaring the first thing I do is to simply ask God to give me a heart that desires him first and others second. It's not a quick fix but the Lord does work and eventually brings me back to where I should be. Me too, Caleb. So painfully aware that I want to give up at times. But prayer, time with God, creates a desire in me to please Him as much as I can, and that starts with obedience. With that, I simply cannot give up. In my experience, most quick fixes aren't what I need anyway, so I'm glad He points me down a different path. When I think of what hardships have accomplished in my life, they've enlarged the part of my heart that lives for God, but they've lessened the part of my heart which longs for idols. Suffering for me is really just when an idol lets me down. And that's really the point of trials and suffering, to help us understand that any idol but God will let us down. 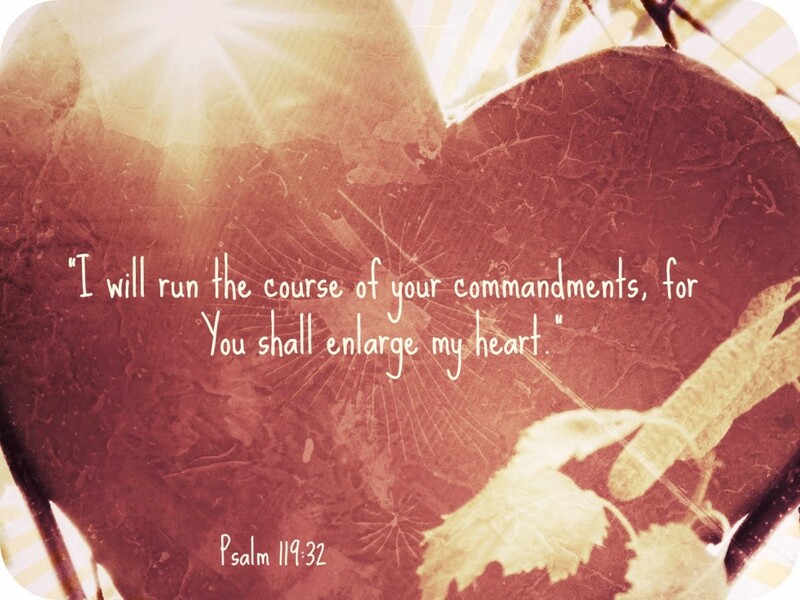 Knowing my sinful nature, I regularly need to surrender my self down and ask God to enlarge my heart. To take my life and heart and give me His heart and mind. Great thoughts, Kari! Great way to say it, Dan. I need to do that often (regularly) too. Thanks for the input.